Regency House is a private, family-owned skilled nursing and rehabilitation facility. Our 60 bed facility is Medicare certified. Due to our intimate size we have the luxury of knowing our residents and their unique needs. Regency House has incorporated many aspects of resident-centered living and resident decision-making. This allows our residents to express their individuality and to lead fulfilling lives. We are passionate about providing the best care possible in order for our residents to live up to their highest potential. Get An Inside Look. Discover What Life At Regency House Is All About. Regency House offers outstanding care in a boutique residential setting. We devote ourselves to knowing our residents – their needs and wants - and providing not only their medical care but also addressing their emotional, spiritual, and social needs. We provide an environment which allows our residents to lead enriched and engaged lives. Our residents are our family. Regency House provides both short-term rehabilitation and long-term care. 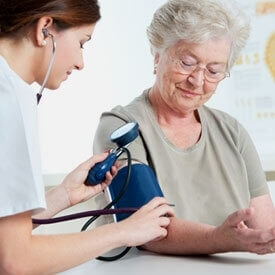 We are committed to providing individualized care of excellent quality with the personal touch. We provide as much autonomy as possible within an environment that nurtures and supports. Our extraordinary interdisciplinary team coordinates every aspect of our resident’s needs, starting with an individualized Plan of Care, ongoing care conferences, and oversight by our Medical Director. Regency House is pleased to partner with Dr. Miguel Garcia-Caro as our Medical Director. Dr. Garcia-Caro has directed and overseen the care of our residents since July, 2014. Dr. Garcia-Caro is a graduate of the University of Puerto Rico and received his Fellowship from Emory University. He is board certified in Rheumatology and Internal Medicine. Dr. Garcia-Caro is a private physician and owner of Central Louisiana Rheumatology and Infusion Center. A Community is Only as Good as Its Residents. Regency House is dedicated to providing exceptional, highly personalized care for our residents. Our intimate size and family atmosphere allows our staff the luxury of knowing our residents and their unique needs. Compassionate, experienced team members apply insights gained from each resident’s unique life story to develop an individualized care program. Regency House strives daily to provide an atmosphere which allows our residents to enjoy life to the fullest. We believe each resident deserves to be treated with respect, attention, and the highest level of care. Regency House provides not only medical care for the resident, but also provides their emotional and spiritual care. "My mother has thrived while she’s been at Regency House. She was there for their therapy program and decided to stay long term. It truly is a great family atmosphere." "After two years of assisted living, I felt my mom, who has dementia, needed more care and supervision. Regency House became the immediate answer after meeting with the director and viewing the property. The facility is a nice size and has the feeling of senior living without any of the stigmas of a nursing home. I have seen a positive change in my mom because of the understanding and friendly staff, and the well-designed activities. I walked out of Regency after my last visit, with a smile on my face from the joy of seeing my mom's good spirits and knowing she is well cared for." "We have been able to interact as a family with staff and personnel in every in-house department and service available. In doing so, we can state with confidence that our daily interpersonal staff communications regarding our mother’s care have been overwhelmingly positive. Personnel have consistently gone the extra mile not only to provide an atmosphere of home and a sense of community, but genuinely care for and about our mother, as only family would do. As our own friends and family members carefully consider the needs of their loved ones, we have and will continue to refer them to Regency House."